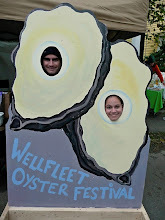 Go Shuck An Oyster: Eating Oysters in a month without an R? Eating Oysters in a month without an R? The June 2009 issue of Cooking Light Magazine offers a great oyster tip and briefly clarifies the old saying, "Never eat oysters in a month without an 'R' in it." The tip says, " Enjoy oysters all summer long (even in months without an "r" in their names) by choosing ones from cooler waters such as Atlantic Bluepoints and Japanese Kumamoto." 1. In the days before refrigeration it was not possible to keep oysters fresh. So if you lived inland you could not get seafood before it spoiled. 2. "Oysters spawn in the warm summer months, usually May through August, although natural Gulfwater oysters can spawn year-round due to the warm waters. Spawning causes them to become fatty, watery, soft, and less flavorful instead of having the more desirable lean, firm texture and bright seafood flavor of those harvested in cooler, non-spawning months. This being said, you can still find good oysters in spring and summer, usually imported from cooler waters or from farms. A new genetic procedure being used by some commercial oyster farms renders farm-raised oysters sterile, so they don't spawn at all, thus making prime oysters available year-round." Another source can be found here. Personally, I can tell you that during May of 2009 I ate plenty of raw oysters and they were great. My local Whole Foods Market was selling four different kinds of oysters during Memorial Day Weekend so I picked up 50 for a BBQ I was hosting at home. My father-in-law and I enjoyed twenty of them the night before the BBQ and my guests sucked down the rest on Memorial Day. 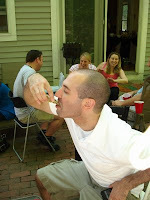 Here is a picture of my good friend Todd enjoying an oyster for the first time in several years. As long as you get your oysters from a reputable place, you should be confident eating them all year round. Go shuck and enjoy.